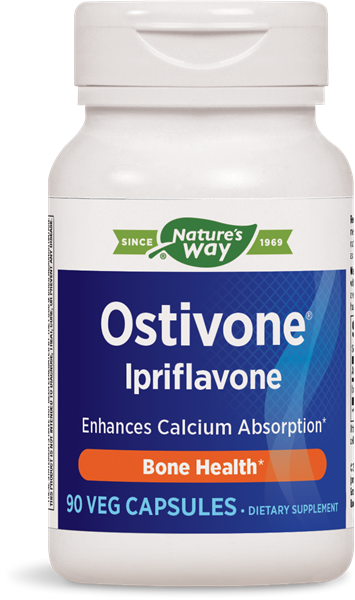 Ostivone®2 / 90 Veg Caps - Nature's Way®. Why worry about bone density? Bone density and strength are important to maintain, especially if you want to keep an active, healthy lifestyle. Take 1 capsule three times daily with meals. For best results, take in conjuction with a multinutrient bone supplement with high potency calcium such as Enzymatic Therapy OsteoPrime®. Ostivone® is a registered trademark of Technical Sourcing International, Inc.
Ostivone® (ipriflavone) may alter the metabolism of drugs metabolized by CYPA2 and CYP2C9. These include many common medications including theophylline. Please consult a healthcare professional before using this product in conjunction with any prescription drug. If pregnant or nursing, consult a healthcare professional before use.